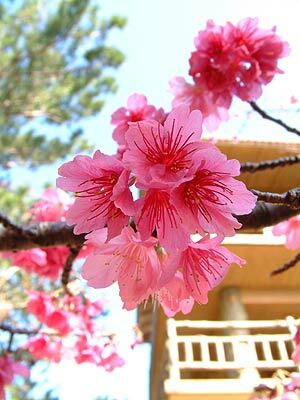 Good timing, too, as this is the weekend for the 43rd Nago Cherry Blossom Festival. The Saturday-Sunday festivities are expected to begin with some of the traditional rain showers that linger over the island this time of year, but temperatures promise to be warmer than a year ago. For the Okinawa newcomer, the Cherry Blossom Festival ranks as one of the most beautiful events of the year, with Mother Nature showing her colors with the traditional flowers. This year’s “best viewing” is forecast through February 6th, although the cherry blossoms will be on the trees across Nago and nearby Mount Yaedake through late February. This weekend’s festival kicks off Saturday with opening ceremonies at 11am, with entertainment running throughout the afternoon and early evening. There’ll be bands and folksongs, young people, and of course, Okinawa dance. You’ll want cameras at the ready at 1pm when the taiko drum performance takes the stage at the festival site. As the sun sets, the last entertainment act is scheduled to begin at 6:50pm. Sunday’s morning is a time for strolling the Nago Castle area, soaking in the cherry blossoms and, perhaps, having a family picnic. Entertainment again begins with a taiko drum show at 1:15pm, followed by Eisa, music, street dances, and rock music throughout the afternoon. An old time Japanese music show starts at 5pm, followed by ceremonies and a closing oldies-pop music concert at 6:30pm. Festivities are held at the base of Nago castle, the expansive home to the local Aji chieftain in the 14th century. The area is now Nago Central Park, where thousands of Taiwan cherry trees show their beauty early each year. This year more than 200,000 pink Taiwan cherries are in full bloom.